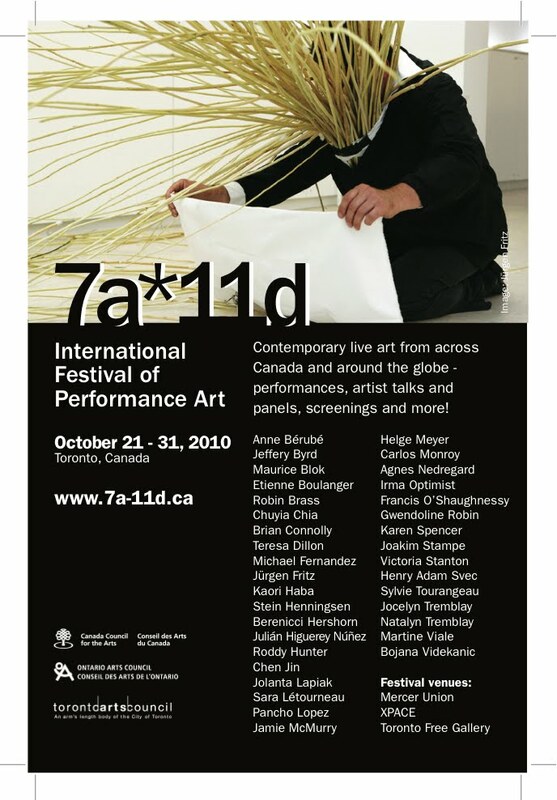 7a*11d is pleased to announce the 8th biennial International Festival of Performance Art to Toronto audiences from October 21 – 31, 2010. The 8th 7a*11d International Festival is the culmination of 14 years of our experiences as a collective, and two years of programming, planning and preparing for the over 30 amazing artists that will descend on Toronto this year. It is also an expression of our pure enjoyment of the work that excites us and inspires us as artists, as curators, and as audience. It takes all of these things to make a festival, and we are proud to offer once again a collection of the best contemporary performance from what has truly become Toronto’s international community. It’s a festival, yes, but it is also a gathering, a family reunion, a conference, an object, a bag of tricks, twice behaved behavior, a marathon artist talk, a workshop, a screening, a special event, and a love letter. We are excited to present a larger and more expanded festival than ever before—with daily and evening performance art events presented in association with our gallery partners—first timers Mercer Union, the ever-faithful XPACE Cultural Centre and our home away from home, Toronto Free Gallery; and with adjunct events at Tranzac Club, The Gladstone Hotel and as always, at various outdoor public sites around the city. For the 2010 festival, we have assembled a stunning variety of emerging and established artists from Alberta, Belgium, China, Colombia, Finland, Germany, Japan, Mexico, Northern Ireland, Norway, Nova Scotia, Ontario, Québec, Saskatchewan, Singapore, Sweden, UK, the US, and Venezuela. In addition to our stellar line-up of evening and daily off-site performance programming, and in collaboration with Toronto Free Gallery, we offer Performance Art Daily, a symposium and series in which invited artists talk about their work as well as the performance practices happening in their own cities and countries, with guest lectures and panel discussions dissecting the compelling issues of global performance. Bookmark our homepage and check back often for updates, programming changes and the locations of our various off-site artists. Read up on the sights and insights of the festival at 7a11d.blogspot.com where we have commissioned two outstanding writers, Daniel Baird and Natalie Loveless, to chronicle each event. secretly, this year we are pleased to honour Michael Fernandes and Sylvie Tourangeau. We invite you to pay special attention to their presentations. With a jam-packed 11 days of performance art events, panel discussions, video/performance screenings and workshops, this is our unseasonal valentine to Toronto, a lifetime’s worth of our crush on performance art. Who is the predator and prey? Trajectory for a paradoxical escape or "The chair's walk"
n. somebody who exercises great power or influence secretly or unofficially. presenting the work of seminal Canadian performance artists. Presented by A Space Gallery and imagineNATIVE Film + Media Arts Festival. Archer Pechawis’ performance on September 17 is co-presented by A Space Gallery, imagineNATIVE Film + Media Arts Festival and FADO Performance Art Centre. RE:counting coup is a new media exhibition that looks at the relational history of indigenous object making with that of a contemporary visual and new media art practice. Curated by Cheryl L’Hirondelle, this group exhibition profiles innovative works by KC Adams, Jordan Bennett, James Luna, Archer Pechawis and Lisa Reihana. These artists’ works attest to Indigenous ingenuity with the realization of performative objects, installations and events that move far beyond what has been over-simplified as solely an orally-centered transmission process to that of an ever-evolving and inventive multi-media tradition. FADO Performance Art Centre is pleased to offer a 5-day performance art workshop facilitated by Norwegian performance artist and educator Agnes Nedregard. This workshop is offered leading up to the dates of the 7a*11d International Festival of Performance Art (October 21 – 31, 2010). Workshop participants will then present short works in early afternoon sessions and in the public realm on the first two days of the festival for festival audiences and visiting artists, organizers and curators. FADO will not turn anyone away due to inability to pay the full fee for the workshop. We offer this workshop at a reasonable fee so no one is restricted. If you have financial concerns, please contact us. If you are traveling from outside of Toronto, we can help you to find reasonable accommodation to fit your budget. This workshop will focus on the performance as an encounter in real time. Question: You might know something about what you are bringing as performer, but what does the audience bring to the performance? There will be an emphasis on process through exercises, using our bodies and creating material, trying to get a bit further in how to be present in a performative encounter. The students will work individually and in groups. Students are asked to bring an open mind and wear loose clothes. Please send a short description of your experience as it relates to the workshop, performance art or related interests, including a brief statement of what you hope to gain from this experience. If you have a CV, artist bio and images of previous work, you are welcome to send those as well. The workshop is open to students, visual artists, performance artists, as well as non-artists, non-students, and non-performance artists. ALL WELCOME. Workshop will have a maximum of 8 participants. Please contact FADO as soon as possible to secure your spot. 50% non-refundable deposit of fee is due on confirmation of participation. Remaining balance is due on or before October 16, 2010. Cheques can be made payable to Fado Performance Inc.
Henry CHAN has been documenting performance art in Toronto since 2006. He has photographed the last two 7a*11d festivals, the activities of FADO Performance Art Centre, as well as events, exhibitions and performances at various contemporary art venues in the city including The Images Festival and The Power Plant Contemporary Art Gallery. When he is not using a camera, Henry is crunching numbers and pushing paperwork as an accountant. Natalie LOVELESS is an artist, teacher and writer. She recently completed a PhD from the University of California, Santa Cruz, on transdiciplinarity and its implications for new models of pedagogy and socially engaged art practices. She is a visiting assistant professor in the Visual Arts Department of the University of Western Ontario and is on the editorial board of >> liminal << the journal of new performance. Natalie’s blog posts are marked ‘(NL)’.